NAIROBI, Dec. 3 (Xinhua) -- Shirleen Leyian grew up in Kenya's semi-arid Kajiado County where nomadic lifestyle that has been practiced by her community for centuries placed enormous hurdles on children and youth yearning for education. The 22-year-old information technology (IT) student at a private university in the Kenyan capital, Nairobi, was among 35 young learners from the nomadic Maasai community who were on November 30 awarded scholarships by Chinese tiles manufacturing firm, Twyford Ceramics Ltd, to enable them to complete their studies. Leyian was in buoyant mood as she joined her peers at the podium to receive cheques from Twyford ceramics Ltd executives to cater for tuition fees and other incidentals during the forthcoming semester. "We are grateful to Twyford Ceramics Ltd for helping us realize our dreams. The company has catered for a huge portion of tuition fees for two consecutive years since I joined the university. It feels good," said Leyian. She defied entrenched negative stereotypes to pursue post-secondary education at a private university and is determined to sharpen her skills in information technology as a means to secure gainful employment in the near future. "I look forward to becoming an accomplished IT professional and promise to give back to the community I come from by mentoring young girls. These girls will be happy to have a role model who has broken the glass ceiling in a profession that has traditionally been reserved for the male gender," said Leyian. Twyford ceramics Ltd, through its local subsidiary KEDA (Kenya) Ceramics Co Ltd, in 2017 launched the Maisha Bora (Healthy Life) scholarship to help cater for tuition fees for under-privileged young learners from villages adjacent to the company's manufacturing plant, which is located about 60 kilometers southeast of the Kenyan capital, Nairobi. Johnstone Mpuki, community liaison at KEDA Ceramics Ltd, said that the scholarship program has transformed the lives of young learners from a community that place little premium on education due to outdated beliefs, poverty and ignorance. "Our target has been children from poor families whose dream for quality education has often been shattered due to abject poverty and sometimes harmful cultural practices like early marriages," said Mpuki. "The financial assistance has inspired these children to study with zeal in the hope that they will become successful individuals later in life," he added. In the last two years, KEDA ceramics Ltd has awarded 100 U.S dollars to each scholarship beneficiary enrolled in high school while the ones in mid-level colleges and universities have been receiving 200 U.S dollars and 300 U.S dollars respectively. Stanley Sipoi, an 18 years old high school graduate who aspires to pursue law in the university, said the financial support from the largest tiles manufacturing company in east and central Africa has been a game changer. "My parents struggled hard to educate me and my siblings until Twyford ceramics Ltd came on board to ease that burden. I will be forever grateful for the company for supporting my high school education for two years and I promise to deliver positive results," Sipoi told Xinhua. He vowed to utilize his success in school to mentor young boys in his native village. KEDA Ceramics Ltd, like other Chinese enterprises based in Kenya, has been at the forefront of transforming livelihoods of communities at its backyard through provision of clean water, tarmacking of roads and award of scholarships to bright but needy young learners. 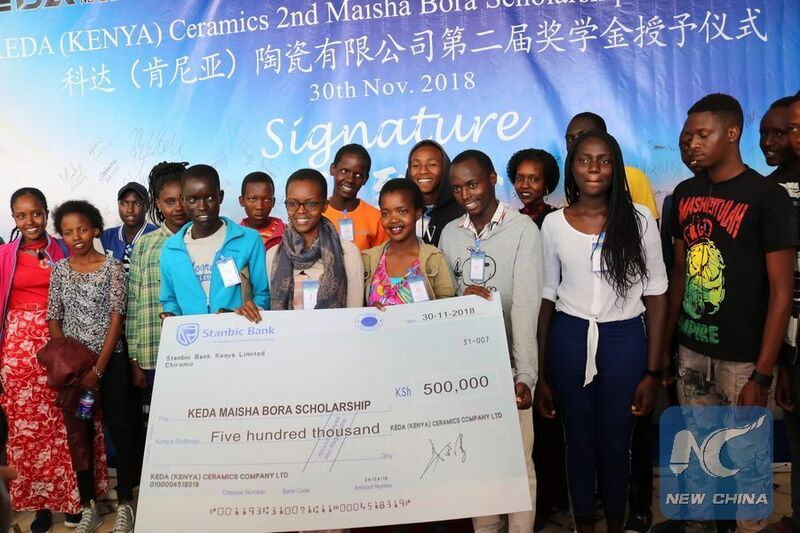 Li Ruiqin, managing director of KEDA Ceramics Co Ltd, said that the aim of the two years old scholarship program is to help financially constrained children and youth from Kajiado County realize their dreams through formal education. Elected leaders from Kajiado County who attended the award ceremony for scholarships to help cater for tuition fees for students from poor families hailed the gesture saying it will help alleviate high illiteracy levels in the community. "We are ready to partner with both local and foreign investors to ensure no child is denied education because of poverty," said Francis Kaesha, minority leader in the county government of Kajiado. Silantoi Teto, a 16 years old form three student in a local high school whose parents are herders, said the financial support from KEDA Ceramics Ltd has motivated her to put more effort in her school work and hopefully join university where she aspires to pursue civil engineering. "Having a philanthropic organization cater for a significant portion of my school fees in the last two years has been refreshing and I'm determined to pass my final exams and join the university to study civil engineering," said Silantoi. The bubbly youngster said her ultimate goal is to utilize skills learnt in school to mentor girls from remote outposts who often lack a role model in the world of academia, careers and business whom they can emulate.